Family movie nights are my families favorite nights and there is no better time to enjoy a good movie than during the summer. 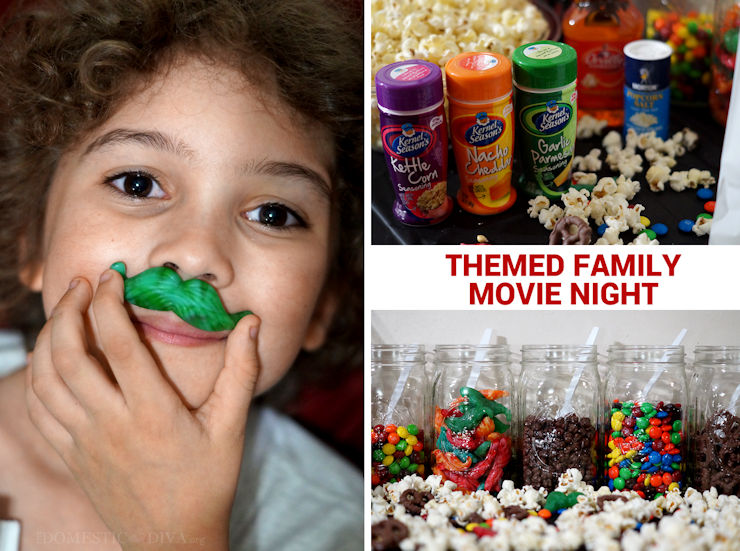 Today, I’ve teamed up with Walmart as a part of the Walmart Moms to share with you a fun movie night idea. Mall Cop 2 will be released on Tuesday, July 14, 2015 in an exclusive two-pack, with the original Mall Cop movie, in Walmart stores and online for $24.87. To celebrate the release, my family and I were sent a copy of the double feature to have a family movie night at home. Of course, the theme of our family movie night is Mall Cop. Mall Cop and Mall Cop 2, for those that have not seen the movie, is a comedy about a man named Paul Blart, with a very handsome mustache, who is a “security officer” at a Mall. He takes his job very seriously and will go to great lengths to do his job. My boys loved the original Mall Cop movie and laugh hysterically at Mall Cop 2. Both films are great and make for an awesome family movie night that everyone will enjoy. We love Kevin James and think he is a fantastic actor. Everyone knows movies are better with popcorn, right? Since we were having a double feature family summer movie night watching Mall Cop and Mall Cop 2. I thought it would be fun to put together a DIY Popcorn Cart sort of like a gourmet popcorn stand you might find in a mall but in the comfort of your own home. What makes our DIY Popcorn Cart different is it gives everyone enjoying the movie the opportunity to mix and match the type of seasoning and candy they want to enjoy during the movie. First we had to create our own popcorn bags. To do this I picked up some basic white lunch bags and a pack of crayons from my local Walmart store. After watching Mall Cop, we all colored and designed our own popcorn bags during “intermission” of our Family Movie Night. To create the Popcorn Cart, I first put a simple party table cover, which can be found in the party section at Walmart, over a small table to make clean up easy after our double feature. We use an air popcorn machine. So I placed our popcorn machine onto our Popcorn Cart table and began popping some popcorn for the family. To allow everyone to mix and match, I picked up several different popcorn flavorings from Walmart like Kettle Corn, Nacho Cheddar, and Garlic Parmesan along with our favorite Orville Redenboker popcorn kernels. Of course, no popcorn would be complete without some Popcorn Butter and Salt (which we already had on hand). Next, I took five large mouth mason jars and filled them with five different kinds of candy. I tried to find a good mix of different varieties of candy like Skittles, M&Ms, Buncha Crunch, Flips, and when I found these mustache shaped gummies by Trolli, I knew they were be absolutely perfect for our Popcorn Cart. I placed a spoon inside each mason jar so that the candy goodies would be easy to scoop out. Once all of the popcorn bags were decorated it was time to fill them with delicious snacks for our second movie, Mall Cop 2. First I filled the bags with regular, plain popcorn and then let each person customize it how they liked it. Some added extra butter and salt to their popcorn, while others preferred the seasoning. After getting their popcorn, the kids loved picking out different candies to sprinkle into their bags with their popcorn. 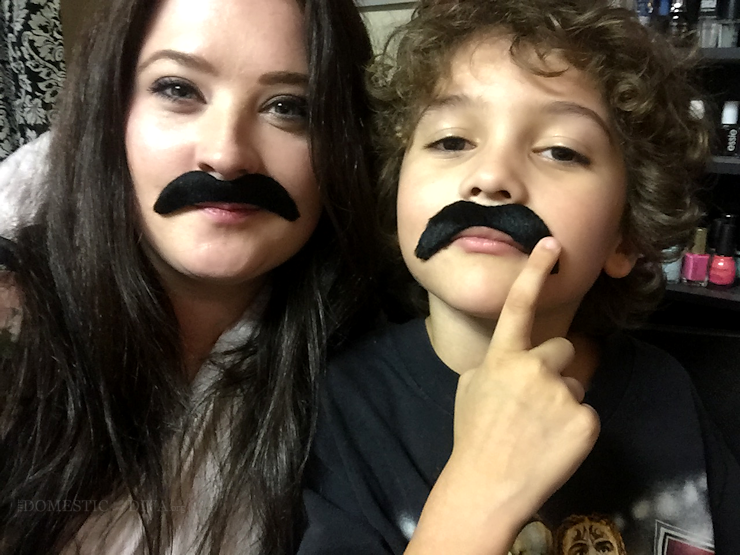 You really can’t go wrong with gummy mustaches and a little chocolate. The best part about the DIY Popcorn Cart is that because everything was located on a small table in the living room, where we were watching the movie, anyone can easily get a refill on snacks if they wanted to in the middle of the movie. My boys loved family movie night with the DIY Popcorn Cart. We had never had a Double Feature movie night before and I can tell you this is probably not going to be our last time. Both the movies and Popcorn Cart were a HUGE hit at our house. We are already making plans on what Double Feature Family Movie Night we should have next. I love that as I plan for our next Double Feature Family Movie Night that I can get everything I need to stock our Popcorn Cart plus our movies of choice with a quick stop at our local Walmart. If you are a fan of the Mall Cop movies like we are, Kevin James (Paul Blart) will be answering questions via Facebook tomorrow night during a Q&A at 7pm ET/ 4pm PT. Mall Cop and Mall Cop 2 movie combo packs are exclusively available at Walmart on either DVD or Blu-Ray. I hope you all have a fun family movie night! Disclosure: As a participant in the Walmart Moms Program, I've received product samples and compensation for my time and efforts in creating this post. All thoughts and opinions are my own. What a lovely thing to do for your family! I can see why your boys loved it. I definitely have to see Mall Cop now.